Thanks to crowdfunding, comics publication is becoming more accessible than ever before, and with every passing day there are more and more independent comics projects vying for backers. The influx of campaigns at Kickstarter, IndieGoGo and elsewhere can get just as overwhelming as trying to find a new comic on the shelves at your local shop. If the premise looks interesting, how likely is it to get funded? Which tiers offer the best values for backers? Paste Comics is committed to bringing you regular coverage of campaigns across the internet that offer not only exciting new ideas, but a solid investment and good value for your money. This month we’re spotlighting a collection of spooky crowdfunding campaigns that will help you ring in Halloween the right way. Death of the Horror Anthology curator Kelly Brack has gathered an all-start team to deliver more than 150 pages of short stories to scare your socks off this Halloween. Featuring comics from the likes of Vita Ayala (The Wilds, Submerged), Ryan Cady (Infinite Dark) and Eric Palicki (No Angel) with art from incredible creators like Emily Pearson (The Wilds) and Brian Level (Avengers), Death of the Horror Anthology promises to deliver a high-quality product. With a publisher already lined up to help manage the production process in A Wave Blue World and a set of reasonable, no-frills rewards, Death of the Horror Anthology is a fairly safe bet in terms of timely final product delivery if it’s able to reach its reasonable $11,863 USD fundraising goal. The campaign has two particularly high-value tiers—a $4 USD tier that promises two pdf stories of your choosing, and an $11 USD tier that offers a PDF copy of the book and PDF process pages. For those who prefer hard copies, a physical edition and a digital copy are available together for $26 USD including shipping. The Death of the Horror Anthology campaign ends on October 31. 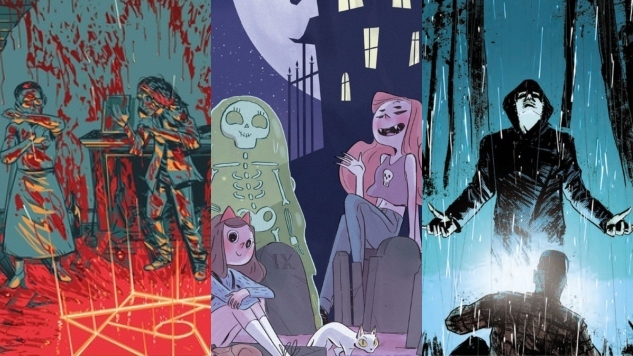 Pat Shand pulls double duty this holiday season, contributing not only to Death of the Horror Anthology but also to Spooky Girls, a 60-page full-color graphic novel with a distinctly Lumberjanes meets Scooby-Doo and the Ghoul School vibe. Shand has teamed up with Agny Innocente, Taylor Krulicki, Mandy Robertson and Angela Oddling to create a distinct and delightful cast of characters just trying to make it through the worst days of any undead kid’s life—high school. One look at the sample pages will have you hooked: Taylor Krulicki’s artwork for “Jenny the Werecat” (about, you guessed it, a werecat) is deadly cute. Shand is an experienced hand with Kickstarters and this campaign is already fully funded with 12 days to go, making this one an extremely safe bet. For $10 USD, you can net a digital copy of the graphic novel; for $20 USD, a physical copy; and for those who love a little extra physical swag, $35 USD will get you both a physical and digital copy plus one enamel pin of your choice by Angela Oddling. (I’m eyeing the four-pin, $55 USD tier myself.) This campaign also wraps on Halloween. Our Final Halloween co-creators Mike Garley and Michael Lee-Graham have embarked on an ambitious project: develop, Kickstart and release a horror comic by and on Halloween. This one-shot follows five kids who find themselves in an abandoned house with no memory of how they got there—and no memory of whose blood they’re covered in, either. As the campaign itself says, Our Final Halloween is intended to be “an event comic,” a single 35-page digital-only issue that readers can pre-order and enjoy on Halloween night. With 11 days to go, this campaign has almost hit its modest $2,598 USD campaign goal. A $4 USD pledge will net you the digital copy of the comic on Halloween night, and $7 USD will get you something even more curious—a director’s cut, featuring an extended edition of the comic, additional backmatter and a six-track original soundtrack for the comic that can be sample in the campaign’s video. Garley has previous experience managing crowdfunding campaigns in his Samurai Slasher horror series, and this is an interesting enough concept both in terms of story and project execution that the $7 USD pledge feels like a bargain for a unique Halloween comic experience.